I have invited several of my writing colleagues to share an essay in answer to this prompt: “What lingers in your memory about a specific place, perhaps a recent vacation or a place you’ve lived? 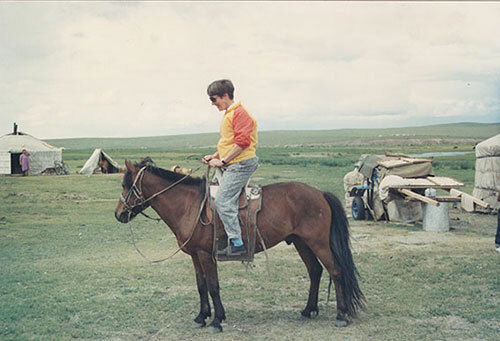 How did this place, or your travels, influence your creative process?” Writer Pat Schaffer writes about her incomparable trip to Mongolia. Not far from the round white felt house called a ger, the family had strung a line between two posts. About ten horses were tethered there. “Would you like to help with milking the mares?” the chief justice asked me. It was the early nineties and we had been invited to Mongolia to talk with judges about Mongolia’s transition from communism. 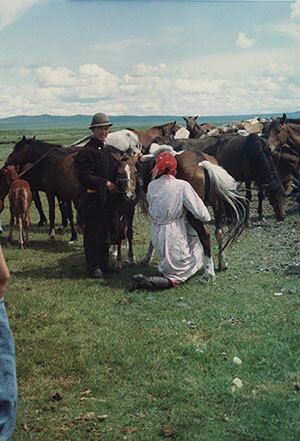 After the conference the chief justice took us to visit his family near Kharkhorin, where they lived in moveable gers and herded horses, cattle, sheep, and yaks in the old way. We had already tasted the mare’s milk from the sack that hung by the ger door. It was slightly tangy, with an after-taste like yoghurt. I put my arms around a long-legged little foal, only a couple of days old. His coat was fuzzy and soft. He twisted his head and wriggled with excitement at my smell, but the judge told me to keep him near his mother’s head. “The mares only release their milk when they can smell their foal next to them,” he explained. The mare rolled her eyes at me, then decided I was not a danger to her foal, and sighed. All her muscles seemed to relax. The woman of the family went down on one knee, an arm on each side of the mare’s hind leg, and milk hissed down into the tin pail beneath her. The woman wore a light colored del, the coat tied with a sash, that both men and women wore in the country, and high leather boots. Beyond the horses, who were nibbling the grass and rubbing shoulders companionably together, the wide Mongolian plain stretched on, pale and open to the vast sky. In the distance, mountains were blue. By the ger stood a motorcycle, but horses were the favorite means of getting around. Mongolians love their horses. I got to ride one of the horses. They are small, a good size for me, but fast and tough enough to have carried the armies of Genghiz Khan all the way across Asia to Europe hundreds of years ago. Place for me is part of the essential core of a story. When I was little, I searched for books that began “Long ago and far away…” Still today I am drawn to books that show me a new land, where people have assumptions about life different from those we take for granted in the United States. Characters only come alive when rooted in their own particular time and place, and before I write, I need to sample as much as I can of the physical details of their lives, the taste of the foods, the smell of the wind, what they see in the grass when they lie on foreign ground. 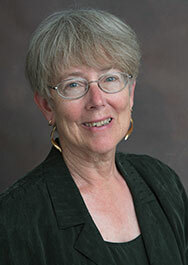 Pat Schaffer is a lawyer who was raised in Montreal and is now living in Minneapolis. She has travelled in many countries, and her experiences around the world have inspired her work. Her first published story, “There’s a Crocodile in our Bath!,” which is set in Sri Lanka, appeared in Cricket magazine.